If you’ve ever thought that your iPhone had the frictional coefficient of a Slip n’ Slide, you’re not alone. 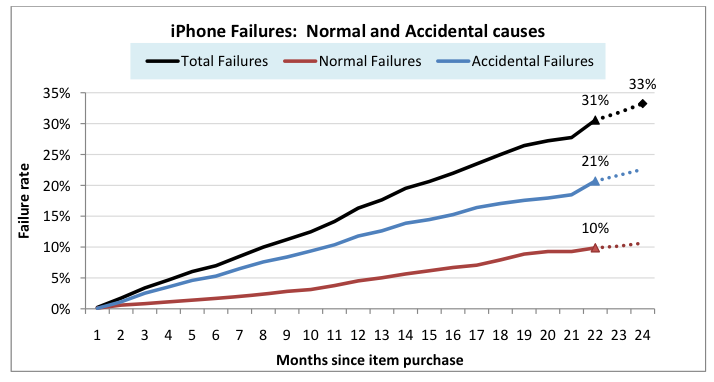 A new report from SquareTrade details the accident-prone nature of Apple’s line of smartphones, reporting that over 20% of iPhones have been damaged in the last 22 months. Cracked screens abound. From a manufacturing standpoint, the iPhone wins higher marks than its competition by a significant margin. 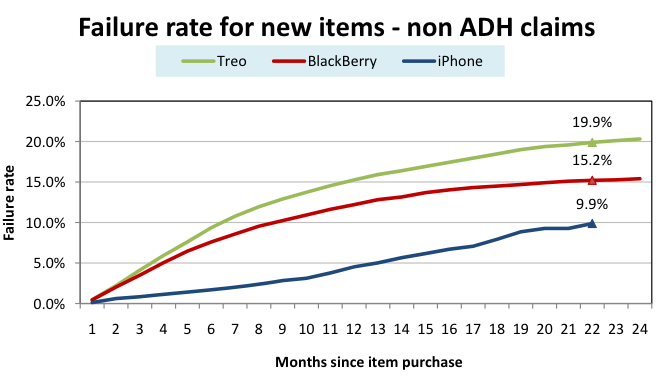 The report says that over the last 22 months, only 9.9% of iPhones have malfunctioned, versus 15.3% of BlackBerry and 19.9% of Treo phones. Apple is getting even better, too: these manufacturing defects were averaged across both the iPhone 2G and 3G, and the report indicates that the latter is significantly more reliable. 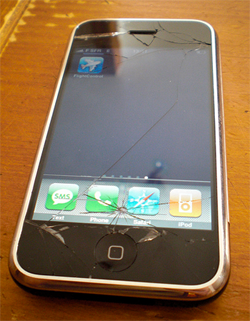 But when it comes to surviving drops, the iPhone doesn’t fare so well. The report says that more than 20% of iPhone owners accidentialy damaged their phones during the 22 months since SquareTrade began tracking the data. The most common cause of death was a drop or fall, which accounted for 66% of the failed phones. Another 25% of them were due to water damage (e.g. dropping your phone into the toilet or pool). The report doesn’t detail exactly why the phone is so prone to accidents, but it isn’t hard to make a few educated guesses. The phone is a sleek, somewhat slippery device, nearly half of which is made up by a glass screen. There are also very few physical buttons to offer a solid grip. And the iPhone’s screen, which is relatively huge compared to the Treo and most BlackBerrys, is obviously going to be more prone to shattering than its smaller counterparts. Wrapping up the iPhone in a case can help matters, but I always feel sort of guilty doing it. The report also highlights the insult-to-injury pricing offered by AT&T for a replacement phone. Depending on how long you have until you’re eligible for an upgrade, you can find yourself paying hundreds of dollars more than you paid for the phone in the first place (though this is typically the case for other phones as well). Finally, it’s worth nothing that SquareTrade is in the business of selling warranties for these phones. This makes them a great source of data, but the company’s conclusions aren’t going to be entirely without bias, either. SquareTrade’s iPhone warranty starts at around $77 for two years, which includes accident coverage (AppleCare does not). You can find full details here. You can find the full SquareTrade report here.